The Junction inlet data table stores information regarding the inlet at the junction node. 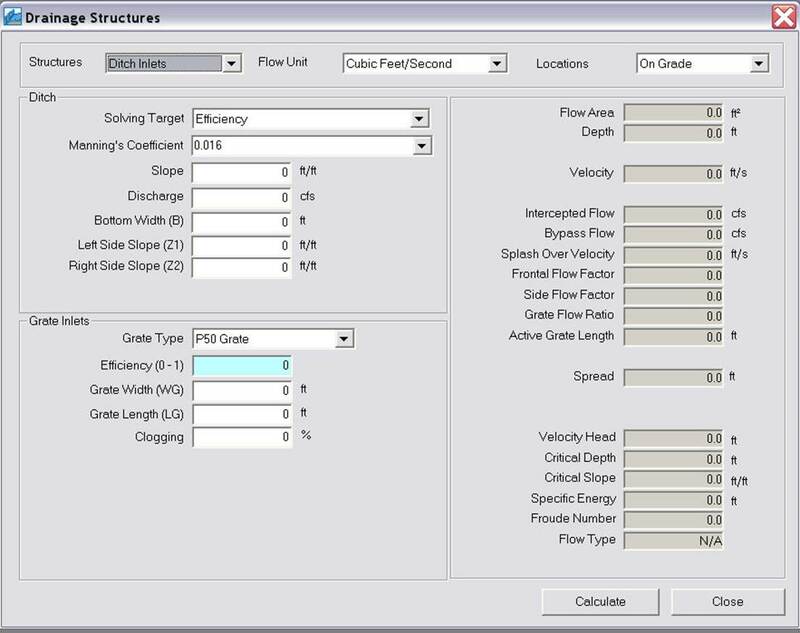 Refer to the section on inflow editor for more information on these input data. The following table shows the whole first row of the DB Table on separate rows in the image. Junction ID Name assigned to the junction. 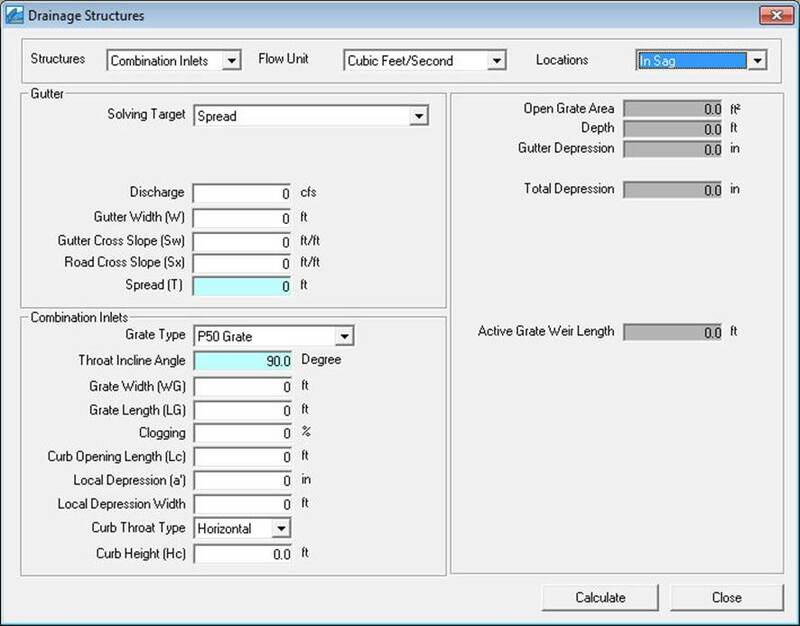 · Depth up to which gate behaves as weir or Threshold Depth in feet or meters. 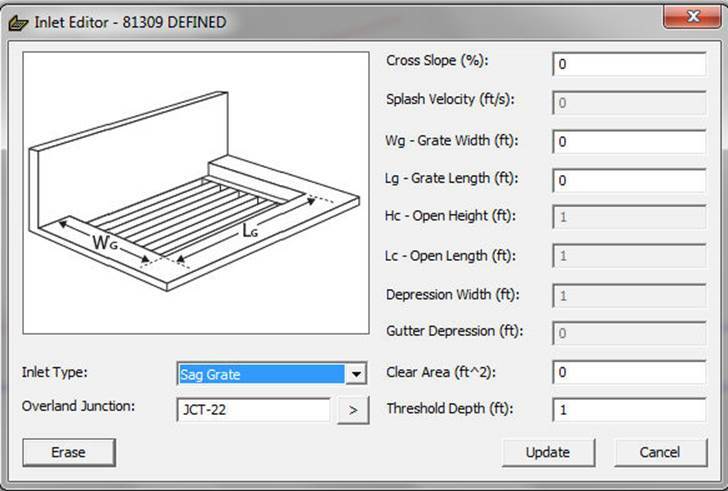 The dialog box for grate inlet on grade is shown below. 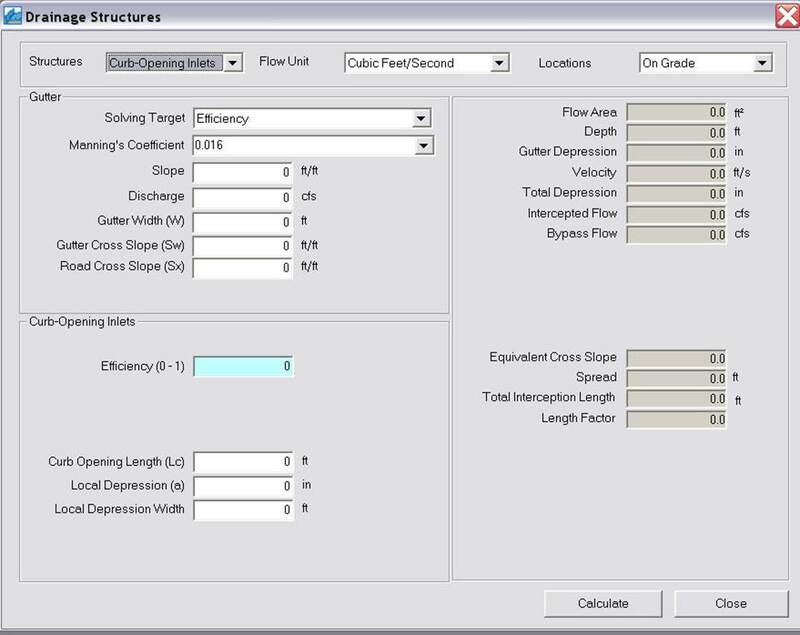 · Flow Unit – Select the desired flow unit. · Location – On grade and in sag. · Solving Target – Efficiency or length. · Manning’s Coefficient – Manning’s roughness coefficient for the gutter. · Slope – Longitudinal slope of the street. · Discharge – Flow rate through the gutter. · Gutter Width –Width of the gutter measured from the curb. · Gutter Cross Slope – Slope of the gutter measured perpendicular to centerline of the street. · Road Cross Slope –Slope of the street perpendicular to the longitudinal direction. · Grate Type – Select one of the eight grate types listed. · Efficiency –Interception efficiency of the grate. It represents ratio of intercepted flow to total gutter flow. · Grate Width – Width of the grate. · Grate Length – Length of the grate. · Clogging – Percentage of the grate opening that is clogged by debris, leaves, etc, and is not available to intercept flow. · Flow Area – Wetted area of the gutter. · Depth – Flow depth in the gutter. · Gutter Depression – Local depression of the gutter measured from the point the cross slope line intersects with the curb. · Velocity – Flow velocity through the gutter. · Total Depression – Sum of the local depression and the gutter depression. · Intercepted Flow – The portion of gutter flow that entered the inlet. · Bypass Flow – The portion of the gutter flow that is not intercepted by the inlet. It is total gutter flow less the intercepted flow. · Splash Over Velocity – Velocity where splash over first occurs. Splash over refers to the fraction of frontal gutter flow that is not intercepted by the inlet. · Frontal Flow Factor – The ratio of intercepted frontal flow to total frontal flow. · Side Flow Factor – The ratio of intercepted side flow to total side flow. 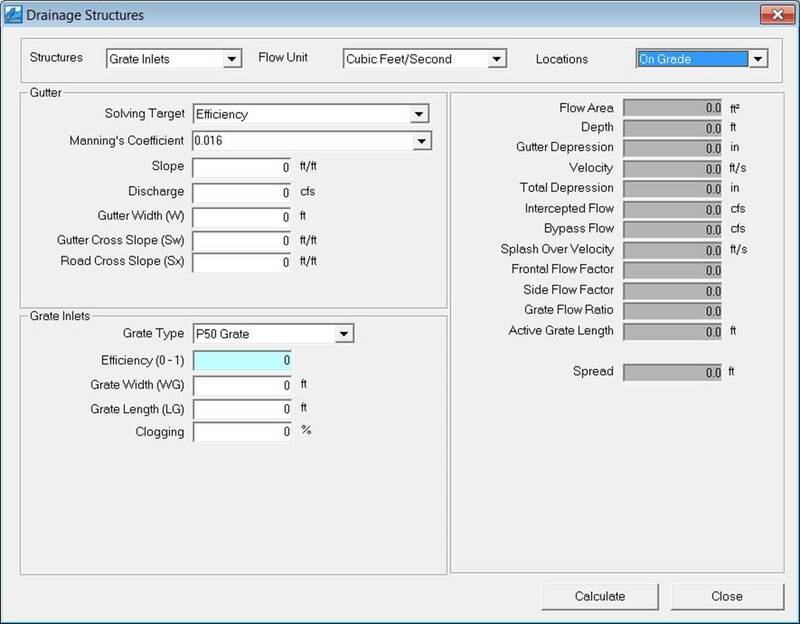 · Grate Flow Ratio – The ratio of frontal flow to total gutter flow. · Active Grate Length – Portion of grate length (the side that is parallel to the curb) that is not clogged. · Spread – Top width, or width of the gutter at the water surface elevation. 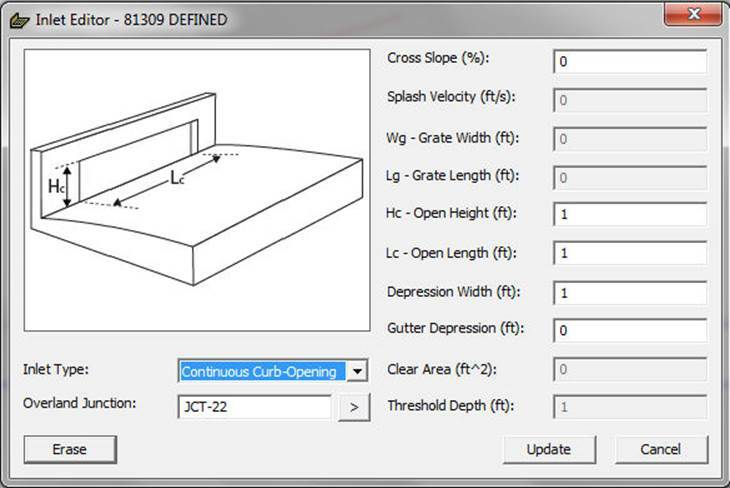 The dialog box for curb-opening inlet on grade is shown below. For methodology click here. · Efficiency –Interception efficiency of the inlet. It represents ratio of intercepted flow to total gutter flow. It is an output if selected as a solving target. · Curb Opening Length – Length of the curb-opening inlet (i.e., length parallel to the curb). · Local Depression – Depth of local depression of the gutter measured from the point where the cross slope line intersects with the curb. · Local Depression Width – Width of the local depression. · Equivalent Cross Slope – An equivalent cross-slope that has a conveyance capacity equal to that of the compound cross-slope. 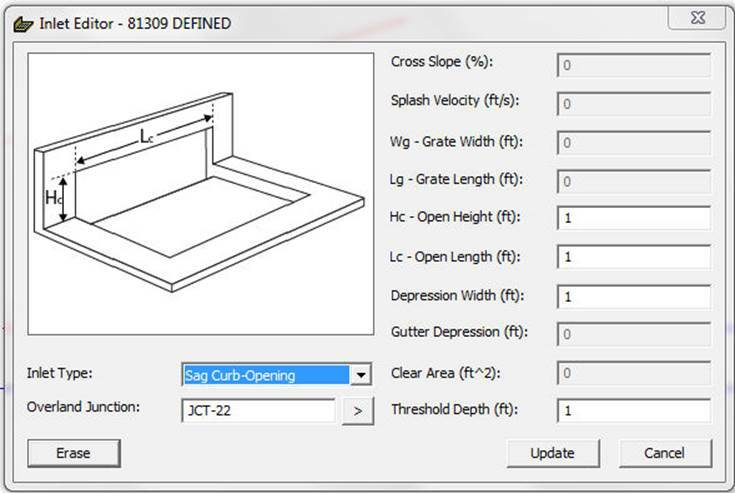 · Total Interception Length – Length of the curb required to intercept 100% of the gutter flow. · Length Factor – Ratio of actual curb length to total interception length. The dialog box for combination inlet on grade is shown below. For methodology click here. · Solving Target – Efficiency, equal opening lengths, or curb opening length. The dialog box for slotted inlet on grade is shown below. For methodology click here. · Locations – On grade and in sag. · Solving Target – Efficiency and length. · Slot Length – Length of the inlet. 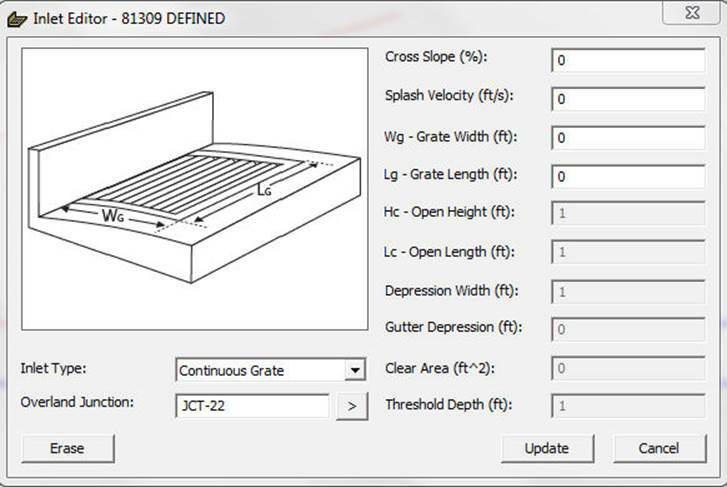 The dialog box for ditch inlets on grade is shown below. For methodology click here. · Bottom Width – Bottom width of the ditch (channel). · Left Side Slope – Left side slope of the ditch. · Right Side Slope – Right side of the ditch. · Velocity Head – Energy head due to velocity. · Critical Depth – Depth corresponding to minimum specific energy of the channel. · Critical Slope – Channel slope under critical depth. · Specific Energy – Sum of velocity head and pressure head. 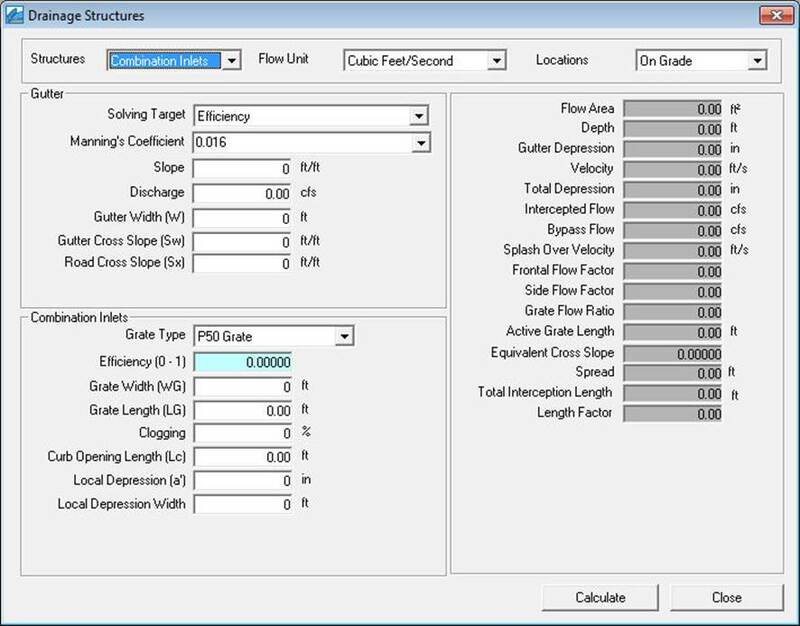 · Froude Number – Flow characteristics dimensionless parameter for the ditch. 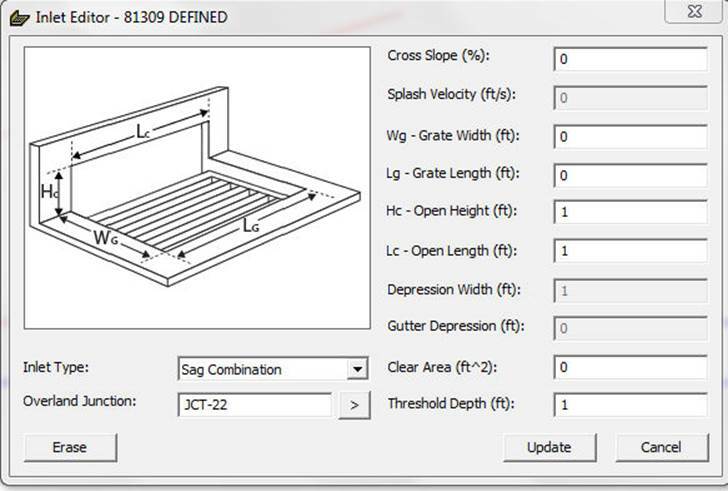 The dialog box for combination inlet in sag is shown below. For methodology click here. · Gutter Width – Width of the gutter measured from the curb to the break in slope of the street. · Spread – Top width, or width of the gutter at the water surface elevation. Could be an output if selected as a solving target. · Throat Incline Angle – Angle of the curb opening throat. · Curb Throat Type – Horizontal, vertical, or incline. · Curb Height – Height of the curb. · Open Grate Area – Clear area of the grate accounting for clogging, and area occupied by the bars depending on the grate type. Used when the grate acts as an orifice. · Total Depression – Sum of the local depression and the gutter depression (measured from the point where the street cross slope meets the curb).